Math is so much fun and means so much more to little ones when it concretely builds understanding. So many times, we skip over “the tough stuff” because we think our little people can’t handle it. Below are a few activities I have done with my five-year-old to begin building two of those “tough” concepts – division and logic. Here’s very simple, engaging early math activity for understanding fair shares and beginning division concepts using The Doorbell Rang by Pat Hutchins. Gather a pile of 12 “friends”. These could be bear counters (like we’ve used), stuffed animals, plastic people, or whatever other toys you have handy. Gather 12 pieces of food. We’ve used M&M’s (because they were handy), but you could use anything – cookies, cereal pieces, crackers, grapes, popcorn – ANYTHING that your child will enjoy as a snack after the activity. Read The Doorbell Rang all the way through once. When the doorbell rings, add two “friends” to your group and have your child rearrange the food for fair shares. Keep reading and rearranging in this manner until the book is finished. You might also count the additional cookies on grandma’s tray and make a new set of fair shares with the larger number. This is just one of many, many concrete lessons you can teach younger (or older) children using literature books. And literature is just one of many methods to make math more “living” or real. Whether you have a preschooler or older children and would like to learn more about how to add “real”, concrete and/or creative lessons into your homeschool, check out Loving Living Math. 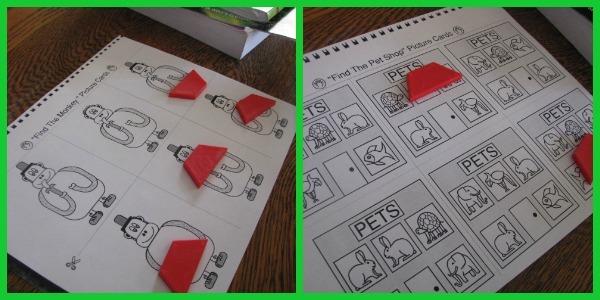 Since logic puzzles at this age can require lots of trial and error, it gets frustrating erasing mistakes all the time. What better way to make those errors seem like no big deal (and save paper), than using manipulatives in place of a pencil! 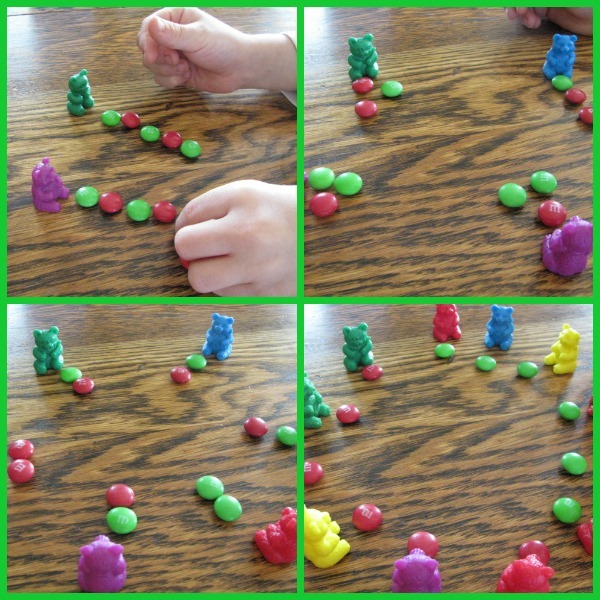 Above left photo: Eli had to determine which colored bears sat in which part of the caves based on a logic pattern. Above right photo: Using clues from the top of the page, he had to determine which bear played which sport. The red and green M&M’s we had been using with The Doorbell rang, served another purpose – the red meant “no” and the green meant “yes”. 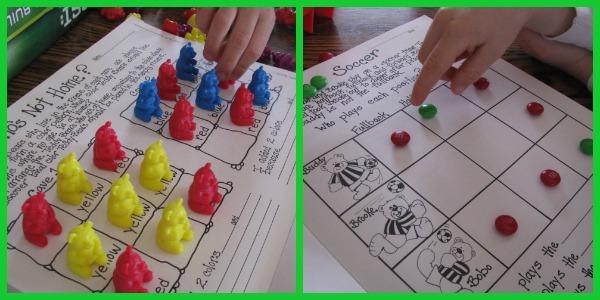 Another good book that promotes early logic is Group Solutions: Cooperative Logic Activities for Grades K-4. This a a book meant to be used by groups of students in a cooperative setting, but my 5yo has simply enjoyed hearing me read the clues aloud while he comes up with the solution. Quite simply, you put a picture board in front of your child with a pile of some sort of manipulative. You read clues one by one and your child uses logical visual discrimination to determine which pictures don’t fit. He covers the pictures that don’t fit to show it’s “out”. By the last clue, your child should have all but one picture covered, showing which picture fits all the clues. Eli loves these! In case you’re super-interested in early logic, another of my favorites is Lollipop Logic. 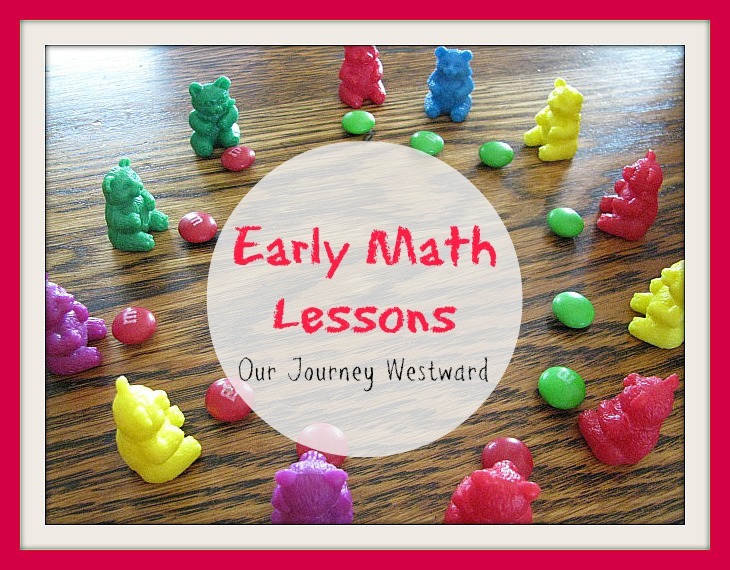 How do you make early math enjoyable! I just did The Doorbell Rang activity with my kids, and they loved it! Thank you for the idea!